Hello lovely friends. How are you today? I am doing good. I just returned from the flower market which left me feeling very inspired. If you are on Instagram, you can see some of my photos if you look me up and follow me there - I'm @decor8. Flowers are such a lovely and affordable way to boost the spirit, aren't they? I'm going to spend some time now putting together some arrangements to dot around my home and office. The punchy colors will look nice! Today I heard from my friend Danielle de Lange, a Dutch blogger, stylist and online shop owner that I've been friends with since I began blogging many years ago. Danielle is an amazing woman, we'd traveled together and still keep in touch and try to see each other every year or so. I'm so grateful for her friendship as she has been a lovely support and fellow blogger and friend throughout the years. I thought I'd show some support in return and blog about some of the new products that she has added to her shop, Le Souk. I really love all of these items and I think that you will to. Danielle has a real knack for, "Mixing modern, traditional and handmade, -- every product at Le Souk is selected with a lot of care and love." So true. See for yourself! About Le Souk: Le Souk is the very best place to discover beautiful and unique products for you and your home. Our collection offers a wide - and still growing- range of home accessories for modern living, as well as personal accessories for you and your kids. Mixing modern, traditional and handmade, every single product at Le Souk is selected with a lot of care and love. Our goal is to make our customer' life -and home- just a bit more beautiful. Le Souk donates at least 5% of its profits to Women for Women. This nongovernmental organisation helps women in war-torn regions rebuild their lives by providing them with job skills training, rights education, access to capital, assistance in small business development and financial and emotional support. 1. & 6. 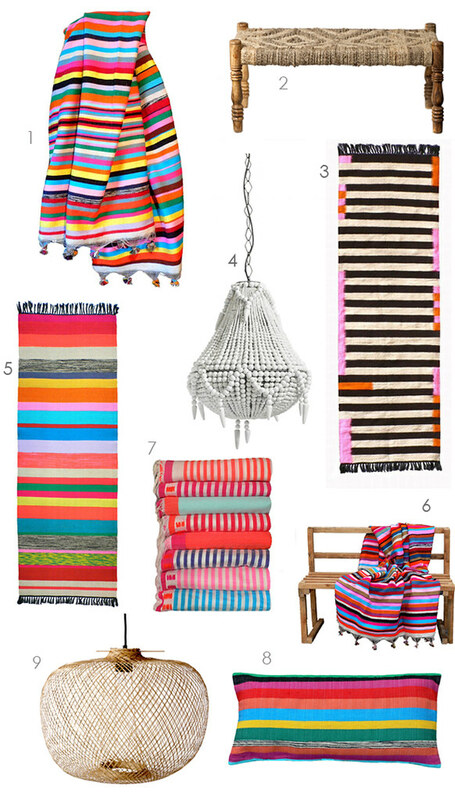 Handmade throw: These one-of-a-kind plaids are hand made in a small workshop in Northern Africa by skilled craftsmen. 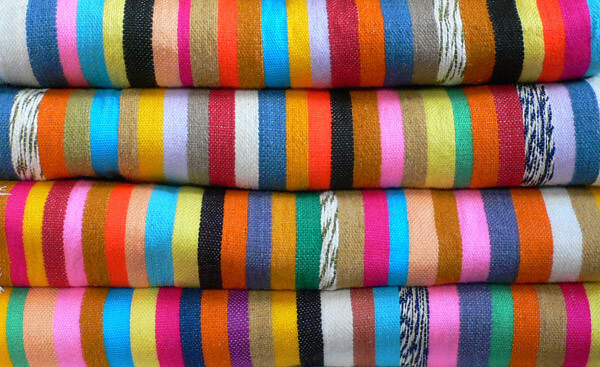 The throws are made according to traditional techniques but have a modern color scheme. No two plaids are identical! Gorgeous bold colors! Available in sizes: 150x200cm and 215x240cm. 2. 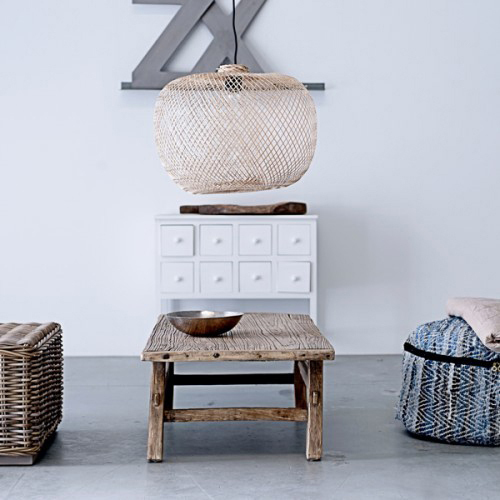 Handmade wooden bench: this lovely bench is made from wood and rope. 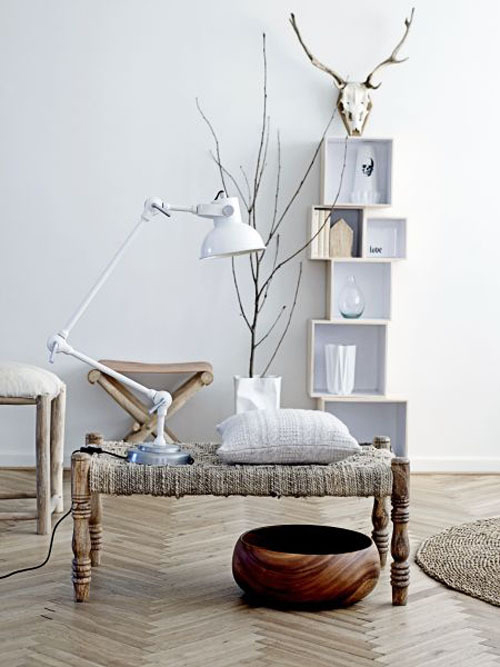 Perfect for a natural style interior! Also available in a smaller stool. 3. Handmade kilim runner in black & white: This unique kilim runner rug is handwoven by three skilled weavers in Tunisia using a traditional wooden weaving loom. The rug is made according to traditional techniques but the design is modern which give the rug a very unique character. 4. Wooden beads chandelier: This large white chandelier is absolutely stunning. It is made of hundreds of chunky wooden beads. The ethnic shape and the use of natural materials make this a true eye-catcher. 5. Handmade kilim runner in bold colors: this unique kilim runner rug is handwoven by three skilled weavers in Tunisia using a traditional wooden weaving loom. The rug is made according to traditional techniques but the design is modern which give the rug a very unique character. Very beautiful color combination! 7. Handwoven tablecloth/bedspread: This beautiful handwoven cloth can be used as a tablecloth, throw or as a bed cover. The stunning colors will brighten up any corner! 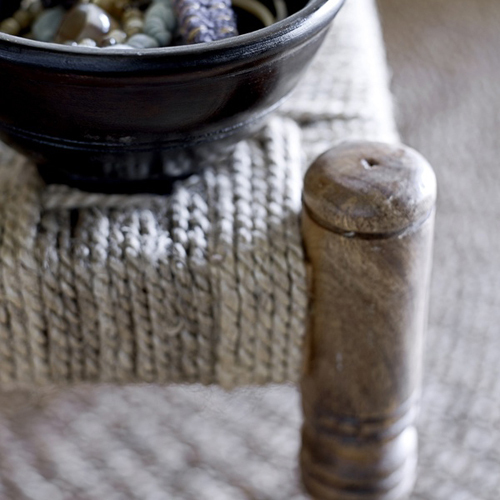 Made from wool and woven by skilled craftsmen in a small weaving workshop in North Africa. 8. Bamboo pendant lamp: The organic shape and the use of bamboo give this pendant lamp a beautiful natural and unique look. 9. 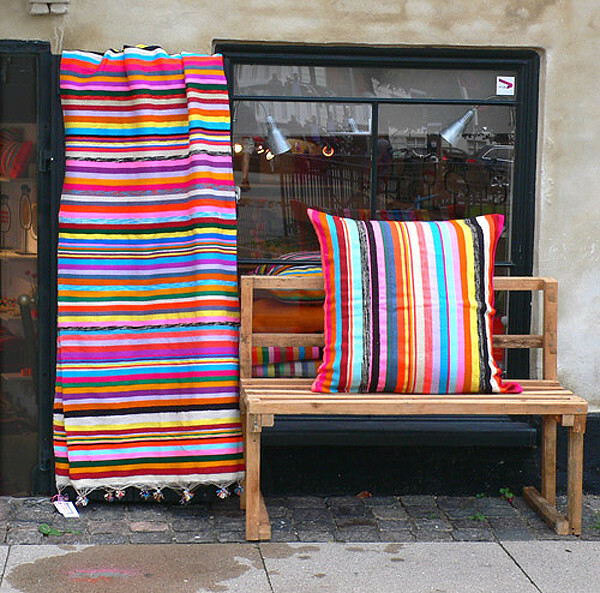 Handmade kilim cushion: This colorful striped cushion is handwoven by skilled weavers in a small workshop in Tunisia using a traditional wooden weaving loom. The cushions are made according to traditional techniques but have a modern color scheme. Beautiful, I'll have one of everything please! Especially the chandelier. Do you remember when I blogged about my obsession for the Mud Studio chandy awhile back? If not, you can see them here and now you can buy one like it at Danielle's shop. Weeee!